The Friends of Derby High School run a second hand uniform shop which is based in the Senior School building. 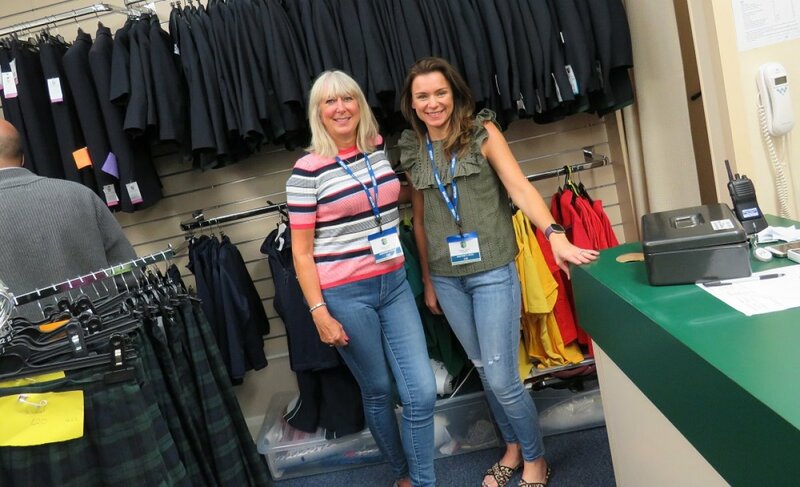 The shop offers parents the opportunity to purchase good quality second hand uniform at very reasonable prices and at a fraction of the cost of new uniform. Sale dates are no longer listed in the school calendar. The shop will open every 2-3 weeks and parents will be notified a week in advance by Highpost. Days and times will vary to suit more parents. To access the Uniform Shop please use the Senior School entrance from the Hillsway car park (which is closest to the Uniform Shop). Please ring the bell labelled Uniform Shop and one of our volunteers will let you in. As a parent, if you have benefitted from our Second Hand Uniform Sales and if you would like to support the ongoing sale of second hand uniform please leave your name at the main Senior School reception for the attention of the FoDHS uniform shop team. We kindly ask that any uniform to be donated to the shop should be sent into school office a few days prior to the shop's next opening date with sale tickets attached. Unfortunately, we cannot accept uniform outside of this time frame due to lack of storage. Any item which is priced too high will be adjusted to bring it within a reasonable selling price. 50% of the selling price will be paid back to the parent at the end of the school year by cheque providing the tickets have been fully completed and the full amount due is greater than £10. Any payment due under this amount will be carried forward to the following year. If you wish items to be fully donated, please send in without any tickets attached and a note in the bag stating 'All Items Donated'. We no longer accept cash or cheques. Payment is by card only. All items for sale are left at owners risk. Only good quality, clean, ironed, undamaged current uniform will be accepted into the sale. (Refer to suggested price list below for list of accepted items). The PTA and school's say is final as to the merchantable quality of uniform entered in to the sale. The PTA will discard any items not considered suitable for resale or donate them to charity (if suitable). We do not accept any shirts, blouses, boys' trousers, socks, shoes, swimwear or any item that is not current school uniform. Please label all items with a sales label & submit your printed sales list (the sales list and labels are available to download, auto complete and print from the Excel spreadsheet below) and attach the label with a safety pin only (adhesive tape may be used for tennis racquets and hockey sticks). Please refer to the suggested price list when adding a price to each item. Any unlabelled items will be deemed to be donations, with profits from their sale given wholly to the PTA funds. No uniform once entered into a sale will be returned to a seller. If after a period of one year an item remains unsold, the price will be reduced if required at the annual stock check. Please help us to help you. It does make economic sense to recycle items that are in good condition. By entering an item for sale, the seller agrees to these terms. Please click here for Second Hand Uniform Labels which you can complete electronically before printing.